Peel and thinly slice the onion. Peel and mince the garlic. Peel the carrot and grate it on the largest side of the box grater. In a medium bowl, whisk the tamari, turbinado sugar, just half of the rice vinegar, and ¼ tsp pepper until the sugar dissolves. Place a large nonstick skillet over medium-high heat with 2 tsp vegetable oil. Once hot, add the seitan and cook until browned and very crispy, about 4 to 5 minutes. Add the sliced onion and cook, tossing frequently, until browned in spots but still crunchy, about 2 to 3 minutes. Add the minced garlic and cumin seeds, toss, and cook until aromatic, about 1 to 2 minutes. Add the tamari sauce. Toss to coat evenly and cook until the sauce thickens slightly, about 30 seconds. In a small bowl, whisk together the remaining rice vinegar, peanut sauce, and a pinch of salt until well combined. Divide the shredded carrot and Arcadian greens between shallow bowls. Top with Cumin Stir-Fried Seitan. 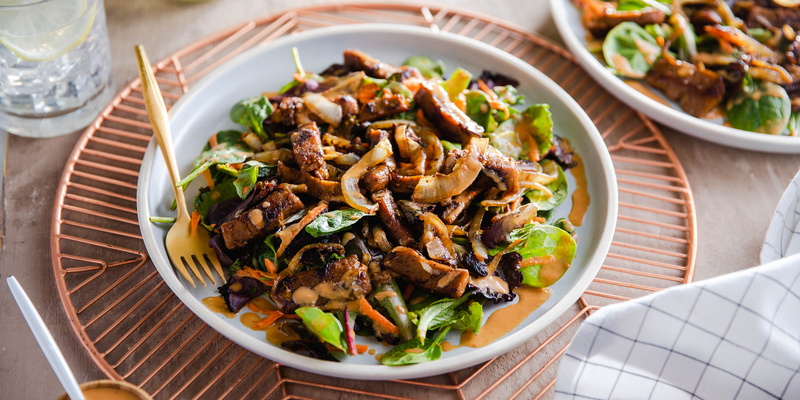 Drizzle with peanut dressing. Tuck in!